The effectiveness of targeting IL-13 in models where airway hyperresponsiveness (AHR) and airway inflammation have already been established is not well-described. We investigated the effects of blocking IL-13 on the early and late phase airway responses and the development of AHR in previously sensitized and challenged mice. BALB/cByJ mice were sensitized (days 1 and 14) and challenged (days 28–30) with OVA. Six weeks later (day 72), previously sensitized/challenged mice were challenged with a single OVA aerosol and the early and late phase response and development of AHR were determined. Specific in vivo blockade of IL-13 was attained after i.p. injection of a soluble IL-13Rα2-IgG fusion protein (sIL-13Rα2Fc) on days 71–72 for the early and late responses and on days 71–73 for the development of AHR. sIL-13Rα2Fc administration inhibited the late, but not early, phase response and the OVA challenge-induced changes in lung resistance and dynamic compliance; as well, sIL-13Rα2Fc administration decreased bronchoalveolar lavage eosinophilia and mucus hypersecretion following the secondary challenge protocols. These results demonstrate that targeting IL-13 alone regulates airway responses when administrated to mice with established allergic airway disease. These data identify the importance of IL-13 in the development of allergen-induced altered airway responsiveness following airway challenge, even when administered before rechallenge of mice in which allergic disease had been previously established. Clinical and experimental investigations have identified CD4+ Th2 cells as crucial in orchestrating the allergic inflammatory response leading to airway hyperresponsiveness (AHR)4 (1, 2, 3). Over the past several years, emphasis has been placed on the role of IL-13 in the development of AHR (4, 5, 6, 7, 8). IL-13 is a pleiotropic cytokine that is secreted by activated Th2 cells with immunoregulatory activities that partially overlap with those of IL-4 (9). The redundancy in biologic responses to IL-13 and IL-4 may be explained by shared components in the receptors for IL-4 and IL-13 (10). IL-13 can regulate IgE isotype switching in B cells, MHC class II and low affinity IgE receptor (CD23, FcεRII) expression on B cells and monocytes, chemokine production, activation of mast cell, eosinophil, and neutrophil function, as well as the inhibition of proinflammatory gene expression by monocyte/macrophage populations (8, 11, 12, 13, 14, 15). IL-13 also increases expression of VCAM-1 on endothelial cells, facilitating the preferential recruitment of eosinophils (and T cells) to the airway tissues (16), and airway mucus secretion, which can exacerbate airway responsiveness (8, 17). Although not necessary for, or even capable of inducing Th2 development, IL-13 plays a regulatory role in Th2 cell activation (18), and in Th1 differentiation indirectly through its down-regulatory effects on production of proinflammatory cytokines, particularly on monocyte production of IL-12 (19). Administration of IL-13, or over expression of IL-13 in the airways, induced airway eosinophilia, mucus production, and AHR to various degrees (4, 7, 8). The role of IL-4 in allergen-induced AHR development has been extensively studied. Using neutralizing Ab to IL-4 administered during the sensitization phase, or in mice deficient in IL-4, the development of airway eosinophilia, AHR, and increases in serum IgE seen following sensitization and allergen provocation are markedly reduced or abolished (20, 21, 22). However, administration of Ab to IL-4 after sensitization but during the allergen challenge phase only partially reduces the response suggesting alternate mechanisms or even a sequential requirement for IL-4 then IL-13 (20, 21, 23). Inhibition of both IL-4 and IL-13-transduced signals in STAT-6-deficient mice or in mice treated at the time of the challenge with an IL-4R antagonist inhibited AHR and airway eosinophilia, suggesting the importance of blocking not only IL-4 but also IL-13 (24, 25). The activity of IL-13 can be specifically blocked by administration of a soluble fusion protein comprised of the extracellular domain of the IL-13 high affinity receptor (IL-13Rα2) fused to the Fc portion of human IgG1, which specifically binds to and neutralizes IL-13 (26). Blockade of IL-13 at the time of allergen challenge in this way inhibited OVA-induced AHR with variable results on bronchoalveolar lavage (BAL) eosinophila (4, 6, 7). To date, most of the studies investigating the role of IL-13 have been performed in models of primary allergen challenge and the role of IL-13 in already established allergic airway disease is not well-defined. In patients with allergic asthma, allergen challenge leads to an early phase response (EPR), occurring within 15–30 min following allergen challenge. About 60% of patients also develop a late phase response (LPR), occurring about 3–5 h after allergen challenge, and characterized by airway obstruction and increased airway inflammation (27, 28). Similarly in mice with already established airway disease, allergen challenge can evoke EPR and LPR (29), followed by the development of sustained AHR (30). We previously showed important differences when a primary challenge approach was compared to mice which had previously been sensitized and challenged and later provoked with a single airway challenge (secondary challenge) (30). We also showed that lung resistance (RL, thought to reflect central airway function) and dynamic compliance (Cdyn; thought to reflect peripheral airway function) are differentially regulated in the latter model (30). The aim of the present study was to evaluate the role of IL-13 on airway function and lung inflammation in a model of allergen-induced AHR after re-exposure to allergen in previously sensitized mice assessed by monitoring EPR and LPR and the development of AHR. Female BALB/cByJ mice were obtained from The Jackson Laboratory (Bar Harbor, ME). The mice were maintained on OVA-free diets. All experimental animals used in this study were under a protocol approved by the Institutional Animal Care and Use Committee of the National Jewish Medical and Research Center (Denver, CO). Ten- to 12-wk-old mice were sensitized by i.p. injection of 20 μg of OVA (Grade V; Sigma-Aldrich, St. Louis, MO) emulsified in 2.25 mg of aluminum hydroxide (AlumImuject; Pierce, Rockford, IL) in a total volume of 100 μl on days 1 and 14. Mice were challenged (20 min) via the airways with OVA (1% in saline) (endotoxin concentration, 0.307 ELISA units (EU)/mg protein; BioWhittaker, Walkersville, MD) for 3 days (days 28, 29, and 30; primary challenge) using ultrasonic nebulization (AeroSonic ultrasonic nebulizer; DeVilbiss, Somerset, PA). Control mice groups received OVA challenge alone. For the secondary challenge protocol, 6 wk after the primary challenge, mice were exposed to a single OVA challenge (1% in saline; secondary challenge), and airway reactivity and tissues were assessed 48 h later (30). To assess EPR and LPR, 6 wk after the primary challenge mice were exposed to OVA (5% in saline) (endotoxin concentration, 0.342 EU/mg protein) for 20 min (29). Murine IL-13Rα2-human IgG (hIgG) fusion protein was prepared as previously described (26). In the secondary challenge protocol, IL-13Rα2-hIgG fusion protein was administered by i.p. injection (300 μg/mouse) 24 h and 1 h before and 24 h after the secondary challenge. In the EPR and LPR study, IL-13Rα2-hIgG fusion protein (300 μg/mouse) was administered 24 h and 1 h before the 5% OVA challenge. As a control, a human IgG (control AB) was administered to one group of animals in the same fashion. To assess airway function following secondary challenge, airway responsiveness was assessed as a change in airway function after challenge with aerosolized metacholine (MCh) administered for 10 s (60 breaths/min, 500-μl tidal volume) in increasing concentrations (1.5625, 3.125, 6.25, and 12.5 mg/ml). Anesthetized (pentobarbital sodium, i.p., 70–90 mg/kg), tracheostomized (18G cannula) mice were mechanically ventilated (160 breaths/min, tidal volume to 150 μl, positive end-expiratory pressure of 2–4 cm H2O) and lung function was assessed using methods described by Takeda et al. (31). RL and Cdyn were continuously computed (Labview; National Instruments, Dallas, TX) by fitting flow, volume, and pressure to an equation of motion. Maximum values of RL and minimum levels of Cdyn were taken and expressed as a percentage change from baseline following PBS aerosol. To monitor EPR and LPR, airway responsiveness was assessed using single-chamber whole-body plethysmography (Buxco Electronics, Sharon, CT) as described previously (29) following changes in enhanced pause (Penh). When responsiveness to the allergen challenge was evaluated, animals were placed in the plethysmograph and baseline values were recorded. At each measurement of airway function, recordings were monitored for 3 min and Penh values measured during this sequence were then averaged. To determine nonspecific responsiveness, Penh was monitored after mice were exposed to nebulized saline for 3 min. All further responses were compared with the Penh values measured after saline inhalation, which was taken as 1. Then animals were provoked with OVA (5% in saline) for 20 min and airway responsiveness was measured at 5, 15, 30, 45, and 60 min and then every 30 min for the ensuing 8 h. The results of EPR are shown in real time. For LPR, the highest increase in Penh was considered as the maximum and values recorded 2.5 h before and after the maximal response are shown (29). Immediately after assessment of AHR, lungs were lavaged via the tracheal tube with HBSS (1 × 1 ml, 37°C). Total leukocyte numbers were measured (Coulter Counter; Coulter, Hialeah, FL). Differential cell counts were performed by counting at least 300 cells on cytocentrifuged preparations (Cytospin 2; Cytospin, Runcorn, Cheshire, U.K.), stained with Leukostat (Fisher Diagnostics) and differentiated by standard hematological procedures. Lungs were fixed by inflation (1 ml) and immersion in 10% formalin. Cells containing eosinophilic major basic protein (MBP) were identified by immunohistochemical staining as previously described using rabbit-anti mouse MBP (kindly provided by Dr. J. J. Lee, Mayo Clinic, Scottsdale, AZ) (32). The slides were examined in a blinded fashion with a Nikon microscope (Melville, NY) equipped with a fluorescein filter system. Numbers of peribronchial eosinophils in the tissues were evaluated using IPLab2 software (Signal Analytics, Vienna, VA) for the Macintosh counting 6–8 different fields per animal. For detection of mucus-containing cells in formalin-fixed airway tissue, sections were stained with periodic acid Schiff (PAS), H&E, and quantitated as previously described (32). Cytokine levels in the BAL fluid were measured by ELISA as previously described (32). IFN-γ, IL-4, IL-5, IL-10, IL-12 (BD PharMingen, San Diego, CA) and IL-13 (R&D Systems, Minneapolis, MN) ELISAs were performed according to the manufacturer’s directions. The limits of detection were 4 pg/ml for IL-4, IL-5, and IL-13 and 10 pg/ml for IL-10, IL-12, and IFN-γ. Serum levels of total IgE and OVA-specific IgE, IgG1, and IgG2a were measured by ELISA as previously described (32). Briefly, 96-well plates (Immulon 2; Dynatech, Chantilly, VA) were coated with either OVA (5 μg/ml) or purified anti-IgE (02111D; BD PharMingen). After addition of serum samples, a biotinylated anti-IgE Ab (02122D; BD PharMingen) was used as detecting Ab, and the reaction was amplified with avidin-HRP (Sigma-Aldrich). IgG2a was detected using alkaline phosphatase-labeled anti-IgG2a (02013 E; BD PharMingen). The OVA-specific Ab titers of the samples were related to pooled standards that were generated in the laboratory and expressed as EU per milliliter. Total IgE levels were calculated by comparison with known mouse IgE standards (BD PharMingen). The limit of detection was 100 pg/ml for total IgE. ANOVA was used to determine the levels of difference between all groups. Comparisons for all pairs were performed by Tukey-Kramer honest significant difference test. Values of p for significance was set to 0.05. Values for all measurements were expressed as the mean ± SEM. To determine whether IL-13 is released after allergen challenge in the lungs of mice with already established airway disease, levels of IL-13 were assessed in BAL fluid. Eight hours after the 5% OVA challenge in previously sensitized and challenged mice, levels of IL-13 were significantly (p < 0.001) increased in BAL fluid compared to nonsensitized control mice (Fig. 1⇓A). In addition, 48 h after the secondary 1% OVA challenge in previously sensitized and challenged mice, levels of IL-13 in BAL fluid were significantly (p < 0.001) higher compared to the nonsensitized control mice (Fig. 1⇓B). Treatment with sIL-13Rα2-Fc significantly (p < 0.001) reduced levels of IL-13 measured in BAL fluid 8 and 48 h after the individual challenges (Fig. 1⇓). Levels of IL-13 are increased in BAL fluid following secondary airway challenge. 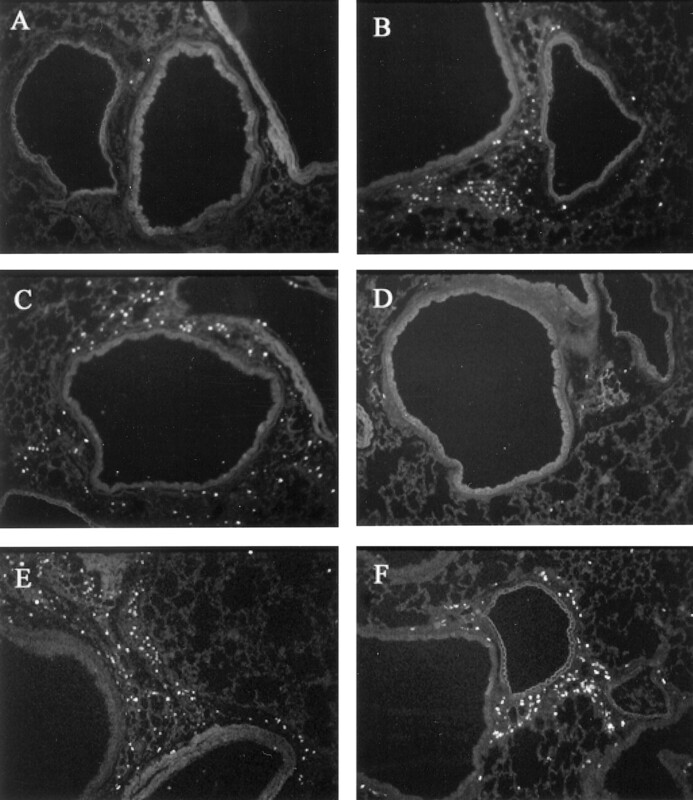 Levels of IL-13 were measured in BAL fluid by ELISA 8 h after the secondary 5% OVA challenge (A) or 48 h after the secondary 1% OVA challenge (B). Means ± SEM of either challenged only mice (neb) (n = 4 in A and B) or sensitized and challenged mice treated with control Ab (huIgG) (n = 4 in A and n = 8 in B) or treated with sIL-13Rα2-Fc (sIL-13 Rc) (n = 8 in A and B) are shown. ∗, p < 0.001 compared to neb and sIL-13Rα2Fc, #, p < 0.01 compared to neb. After exposure to 5% OVA, sensitized and challenged mice developed both an EPR and a LPR. Relative increases in Penh reached a maximum at 15 min after the OVA challenge and returned to baseline 60 min after the challenge (Fig. 2⇓). This early increase in Penh was only seen in mice which were previously sensitized and challenged and not in nonsensitized mice. Sensitized and challenged mice treated with sIL-13Rα2-Fc showed the same early Penh increase as the mice treated with the control Ab (Fig. 2⇓). Mice previously sensitized and challenged to OVA and treated with the control Ab developed LPR (Fig. 2⇓). In contrast, sensitized and challenged mice treated with sIL-13Rα2-Fc did not develop a LPR response (Fig. 2⇓). Treatment with sIL-13Rα2Fc inhibits LPR after allergen challenge. After the secondary allergen provocation with 5% OVA, airway changes were monitored using whole-body plethysmography. EPR were detected in sensitized and challenged mice treated with the control Ab (huIgG) (n = 8) as well as in mice treated with sIL-13Rα2Fc (sIL-13 Rc) (n = 12). No response in challenged only control mice was detected (neb) (n = 8). A LPR following allergen challenge was only present in the huIgG group whereas sIL-13Rα2Fc-treated mice did not develop this response. Means ± SEM are shown. #, p < 0.05 compared to neb; ∗, p < 0.05 compared to neb and sIL-13 Rc. In previous studies, the development of an LPR has been associated with inflammatory changes in lung tissue (29). To determine if neutralization of IL-13 affects inflammatory changes in the lung, we assessed tissue inflammation 8 h after the 5% OVA challenge. Lung tissue was stained with H&E, PAS, and anti-MBP. H&E-stained slides showed a slight increase in peribronchial inflammation in sensitized and challenged animals (Fig. 3⇓C) compared to the nonsensitized animals (Fig. 3⇓A). Mice treated with sIL-13Rα2-Fc demonstrated similar increases in tissue inflammation (Fig. 3⇓E). MBP staining of lung tissue revealed a significant (p < 0.01) increase of eosinophils in peribronchial lung tissue in sensitized and challenged mice treated with the control Ab (mean ± SEM: 43 ± 7 eosinophils/mm basement membrane (BM)) or sIL-13Rα2-Fc (36 ± 5 eosinophils/mm BM) (Fig. 4⇓C), compared to the nonsentitized mice (1 ± 0 eosinophils/mm BM) (Fig. 4⇓A). Effect of sIL-13Rα2Fc treatment on tissue inflammation and goblet cell hyperplasia in sensitized and challenged mice 8 and 48 h following allergen challenge. 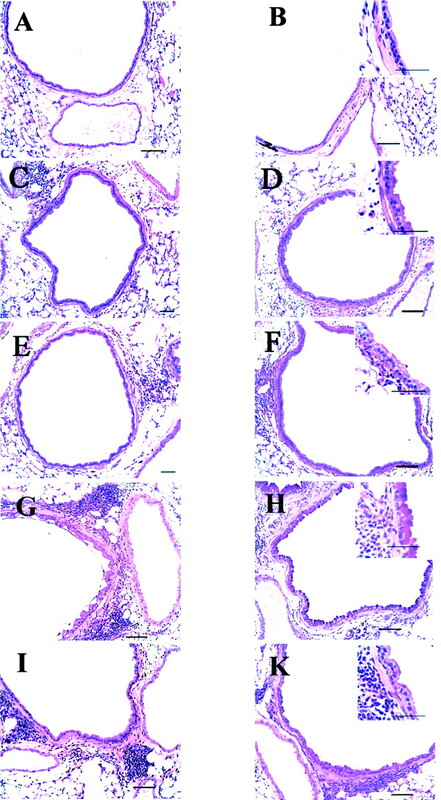 Tissue inflammation was detected using H&E staining (A, C, E, G, and I), and goblet cell hyperplasia after PAS staining (B, D, F, H, and K), in challenged only mice (A and B), sensitized and challenged mice treated with the control Ab 8 h following 5% OVA challenge (C and D) and 48 h after 1% OVA challenge (G and H) compared to mice treated with sIL-13Rα2Fc 8 h following 5% OVA challenge (E and F) and sIL-13Rα2Fc-treated mice 48 h after 1% OVA challenge (I and K). Eight hours following the 5% OVA challenge some inflammatory changes are present in the control Ab-treated as well as the sIL-13Rα2Fc-treated group. At 48 h following the 1% OVA challenge, sIL-13Rα2Fc treatment decreased, but did not abolish, inflammatory infiltrates in lung tissue (E and I) compared to the sensitized and challenged mice treated with control Ab (C and G). In both models, treatment with sIL-13Rα2Fc abolished goblet cell hyperplasia (F and K) compared to the control Ab-treated mice (D and K). Bar = 50 μm. Tissue infiltration with MBP+ eosinophils 8 and 48 h after secondary challenge. Immunohisotochemical (MBP) localization of lung tissue eosinophils was determined 8 h after the 5% OVA challenge (see Materials and Methods) in challenged only mice (A), sensitized and challenged mice receiving the control Ab (B), and sensitized and challenged mice treated with sIL-13Rα2Fc (C) and 48 h after the secondary 1% OVA challenge (see Materials and Methods) in challenged only mice (D), sensitized and challenged mice receiving the control Ab (E), and sensitized and challenged mice treated with sIL-13Rα2Fc (F) (final magnification, ×64). To assess goblet cell hyperplasia tissue, slides were stained with PAS. At this time point, challenged only mice showed no PAS-positive cells (mean ± SEM: 0 ± 0 PAS positive cell/mm BM) (Fig. 3⇑B), whereas sensitized and challenged mice treated with control Ab showed goblet cell hyperplasia (67.4 ± 11.7 PAS-positive cells/mm BM) (Fig. 3⇑D). Few PAS-positive cells were detected in mice treated with the sIL-13Rα2-Fc (4.2 ± 2.8 PAS-positive cells/mm BM) (Fig. 3⇑F). To evaluate the effect of sIL-13Rα2-Fc on the development of nonspecific AHR to inhaled MCh in fully allergic mice, we waited 6 wk after the primary challenge and then rechallenged the animals. We have previously shown that at this time point, the inflammatory reaction and AHR developing after primary challenge are resolved but that a secondary airway challenge induces a strong inflammatory reaction with development of AHR (30). Indeed, previous sensitized and challenged mice showed an increase in RL and a decrease in Cdyn to MCh (Fig. 5⇓) 48 h after the secondary challenge. Under these conditions, sIL-13Rα2-Fc treatment inhibited both the increases in RL and decreases in Cdyn (Fig. 5⇓). Baseline RL and Cdyn were not affected by allergen or sIL-13Rα2-Fc treatment (data not shown). sIL-13Rα2Fc inhibits both RL and Cdyn changes in sensitized and challenged mice in the secondary challenge protocol. RL (A) and Cdyn (B) were measured in sensitized and challenged mice 48 h after the secondary challenge. Sensitized and challenged mice treated with control Ab (IPN/huIgG) showed increased RL and decreased Cdyn to inhaled MCh compared to challenged only mice treated with sIL-13Rα2Fc (neb/sIL-13 Rc) or a human IgG control (neb/huIgG). Sensitized and challenged mice treated with sIL-13Rα2Fc (IPN/sIL-13 Rc) showed no hyperresponsiveness. ∗, p < 0.05 compared to all other groups. In sensitized mice, inflammatory cell recruitment into the airways was increased after secondary airway challenge (Fig. 6⇓). Increased total cell numbers was largely due to increased numbers of eosinophils. There was also a small but significant (p < 0.05) increase in the number of lymphocytes and neutrophils compared to the challenged only mice (Fig. 6⇓). Administration of sIL-13Rα2-Fc at the time of the secondary challenge led to a significant (p < 0.05) decrease in total cell numbers as well as in eosinophil numbers (Fig. 6⇓). sIL-13Rα2Fc inhibits BAL inflammation in sensitized and challenged mice in the secondary challenge protocol. Total cell number, macrophage, lymphocyte, neutrophil, and eosinophil numbers were evaluated in BAL fluid 48 h following the secondary challenge in sensitized and challenged mice treated with control Ab (IPN/huIgG) or with sIL-13Rα2Fc (IPN/sIL-13 Rc) and in challenged only mice treated with sIL-13Rα2Fc (neb/sIL-13 Rc) or human IgG control (neb/huIgG) (all groups n = 8). Results are expressed as means ± SEM. ∗, p < 0.05 compared to all other groups; #, p < 0.05 compared to neb/sIL-13 Rc and neb/huIgG. Lung tissue was obtained and processed 48 h after the secondary allergen provocation. Increased peribronchial and perivascular inflammatory infiltrates were seen in sensitized and challenged mice treated with the control Ab (Fig. 3⇑G). Mice treated with sIL-13Rα2-Fc still demonstrated an inflammatory infiltrate, albeit reduced overall (Fig. 3⇑I). To specifically quantitate the infiltration of eosinophils, tissue sections, were stained with anti-MBP Ab. After the secondary challenge, sensitized and challenged mice treated with the control Ab (Fig. 4⇑E) demonstrated a significant increase in peribronchial MBP-positive cells compared to control mice (Fig. 4⇑D) (means ± SEM; 89 ± 5 eosinophils/mm BM in mice treated with the control Ab compared to 3 ± 0 in challenged only mice p < 0.001). The number of peribronchial MBP-positive cells after the secondary challenge was significantly lower in sIL-13Rα2-Fc-treated mice (Fig. 4⇑F) (55 ± 7 eosinophils/mm BM), but were still significantly higher when compared to challenged only mice (p < 0.01, respectively). To assess the degree of goblet cell hyperplasia, tissue sections were stained with PAS. After secondary challenge, challenged only mice showed no PAS-positive cells (mean ± SEM: 0 ± 0 PAS-positive cells/mm BM, whereas sensitized and challenged mice treated with control Ab showed many PAS-positive cells (122.7 ± 4.7 PAS-positive cells/mm BM) (Fig. 3⇑H). In contrast, sensitized and challenged mice treated with sIL-13Rα2-Fc showed only scattered PAS-positive cells (10.5 ± 5.9 PAS-positive cells/mm BM) (Fig. 3⇑K). Forty-eight hours after secondary allergen challenge, BAL fluid was obtained to assess Th1 (IFN-γ), pro-Th1 (IL-12), Th2 (IL-4, IL-5), and anti-inflammatory cytokine (IL-10) levels. After the secondary challenge, Th1 (IFN-γ) and pro-Th1 (IL-12) cytokines, as well as IL-10, were decreased in sensitized and challenged mice treated with the control Ab compared to challenged-only mice (Fig. 7⇓). IL-5 production was increased in sensitized and challenged mice treated with control Ab. Treatment with sIL-13Rα2-Fc did not significantly affect IFN-γ, IL-12, or IL-10 production, but significantly inhibited IL-5 production (Fig. 7⇓). IL-4 was not detectable in the BAL fluid of challenged only mice. In sensitized and challenged mice treated with the control Ab, mean (±SEM) levels were 38.8 ± 12.1 pg/ml. Levels of IL-4 were lower in sensitized and challenged mice treated with sIL-13Rα2-IgG mice (23.2 ± 2.2 pg/ml) but did not achieve statistical significance (p = 0.12) compared to the control Ab-treated mice. sIL-13Rα2Fc effects on BAL cytokine profiles in sensitized and challenged mice in the secondary challenge protocol. 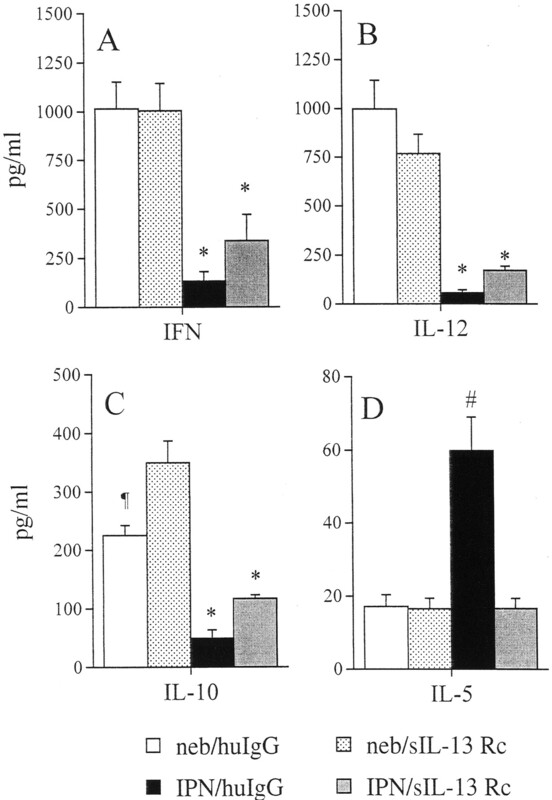 IFN-γ (A), IL-12 (B), IL-10 (C), and IL-5 (D) levels were measured 48 h following allergen challenge in sensitized and challenged mice treated with control Ab (IPN/huIgG) or sIL-13Rα2Fc (IPN/sIL-13 Rc), and challenged only mice treated with sIL-13Rα2Fc (neb/sIL-13 Rc) or its human IgG control (neb/huIgG) (n = 8 in each group). Means ± SEM are given. ∗, p < 0.05 compared to neb/hIgG and neb/sIL-13 Rc; ¶, p < 0.05 compared to neb/sIL-13 Rc; #, p < 0.001 compared to all other groups. Serum from sensitized and challenged mice treated with control Ab showed elevated Ig levels compared to nonsensitized control mice following the secondary challenge protocol (Table I⇓). Treatment with sIL-13Rα2-Fc did not significantly alter levels of total IgE, OVA-specific IgE, IgG1, or IgG2a (Table I⇓). The exact mechanisms underlying the development of AHR are still incompletely understood and there are several areas of controversy surrounding murine models of allergen-induced AHR. This is perhaps not surprising given the findings that different strains of mice, different experimental protocols, and different read-outs of airway function have been used in response to bronchoconstrictive agents administered via different routes. In this study, we evaluated the role of IL-13 in the development of allergen-induced EPR and LPR and AHR in sensitized and challenged mice after secondary allergen challenge. We demonstrate that treatment with a specific inhibitor of IL-13 effectively prevents development of the LPR as well as development of AHR after allergen re-exposure in previously sensitized mice, a model that perhaps resembles more closely human exposure history. Blockade of IL- 13 was achieved following systemic administration of a soluble fusion protein (slL- 13 Rα2-Fc) consisting of the extracellular domain of the murine IL-13 high affinity receptor fused to the Fc portion of human IgG1; this fusion protein specifically binds to and neutralizes IL-13 (26) and as demonstrated in the present study, lowered IL-13 levels in BAL fluid of sensitized and challenged mice following treatment compared to mice treated with a control Ab. It has been shown previously that administration of this fusion protein in OVA-sensitized and challenged A/J mice inhibited the development of AHR and mucus production, but did not affect airway inflammation or OVA-specific IgE (7). In a different mouse strain (BALB/c mice), treatment with the same fusion protein inhibited AHR, mucus production, and BAL eosinophilia, without any effect on BAL neutrophilia (4). These results highlight some of the strain-to-strain differences following a primary challenge protocol. As a corollary, when administered intranasally, rIL-13 induces AHR, BAL eosinophilia and neutrophilia, and mucus production (7). Previous work from this laboratory, using similar approaches, demonstrated temporal differences in the up-regulation of IL-4 then IL-13 production in allergen-induced AHR and inflammation, at least following a primary, single intranasal challenge with allergen in sensitized mice (32). As well, we defined differences in the nature of the inflammatory infiltrate, in the read-out of airway function monitored and in the response to interventions when primary and secondary challenge protocols were compared (33). Given the suggestive potency of IL-13 blockade in effectively preventing a number of these responses in primary challenge models (4, 7) and the increased levels of IL-13 in BAL fluid following secondary challenge, we examined the effects of the IL-13 inhibitor in a secondary exposure model of previously sensitized mice. Treatment with slL-13Rα2-Fc decreased, but did not completely abolish, airway inflammation following secondary challenge. When compared to control Ab (human IgG) treated mice, numbers of eosinophils and lymphocytes were decreased about 60% in the BAL fluid. Nonetheless, despite the presence of residual inflammatory infiltrates following treatment, AHR was virtually abolished following secondary challenge. This absence of a direct correlation between BAL and tissue eosinophilia numbers and AHR is now well-described in many species, including humans. Although there is a clear-cut relationship between AHR and eosinophil numbers (perhaps more in tissue than in BAL; Ref. 32) in many studies, a number of exceptions have now been described. A major deficiency in trying to correlate eosinophil numbers and airway function is the absence of a reliable marker of eosinophil activation. The findings in the present study are also similar to results described in IL-13-deficient mice. After sensitization and airway challenge, IL-13-deficient mice demonstrate the same degree of airway inflammation as wild-type mice, but IL-13-deficient mice failed to develop AHR (6), suggesting that airway inflammation or at least the accumulation of inflammatory cells in the airways in the absence of IL-13 is not sufficient for the development of AHR. This was certainly true in the present study for mice in which airway disease had already been established. Treatment with sIL-13Rα2-Fc completely prevented the development of the LPR and AHR after secondary challenge, whereas inflammatory changes were only reduced. These data suggest that IL-13 is critical to the development of AHR, perhaps beyond the association with numbers of inflammatory cells, eosinophils, lymphocytes, or neutrophils. In agreement with previous studies (4, 7), treatment with sIL-13Rα2-Fc abolished goblet cell hyperplasia and induced mucus secretion, probably by direct reduction of MUC-5 gene expression in epithelial cells (17). These responses are not affected in IL-5- and eotaxin-deficient mice (which fail to develop airway eosinophilia), indicating that IL-13-induced mucus secretion is dissociated from airway eosinophilia (14). This dissociation of airway inflammation, mucus cell hyperplasia, and altered airway function has been described (34). In STAT6-deficient mice, reconstitution of STAT6 only in epithelial cells was sufficient for IL-13-induced AHR and mucus production in the absence of inflammation, demonstrating the importance of IL-13 directly on airway epithelial cells for mucus production and development of AHR. IL-13 shares structural characteristics and functional properties with IL-4. The IL-4Rα chain is a component of the IL-4 and the IL-13 receptors (12). Signaling through the IL-4Rα chain induces STAT6 activation, which is critical for the development of AHR and airway inflammation (25). Despite these similarities, IL-4 and IL-13 have differences in their function in allergen-induced airway disease. IL-4 is critical for Th2 cell induction (35), especially during the sensitization phase (20, 21, 22), but it has been shown that in the absence of IL-4, AHR, lung eosinophilia and mucus production can still be induced (36). In contrast, IL-13 appears to be critical during the airway challenge phase, at least for the development of AHR (6, 7). IL-13-deficient mice develop airway inflammation, without developing AHR, whereas mice lacking both IL-4 and IL-13 neither develop airway inflammation nor AHR (6). It has been proposed that IL-4 is required for the persistence of Th2 cells in vivo (37) and the presence of IL-4 might be more important in chronic airway disease. In the present study, following the secondary challenge protocol, sIL-13Rα2-Fc was effective in preventing the development of AHR after allergen provocation, without significantly altering IL-4 levels in BAL fluid. In the same model, neutralization of IL-4 using a soluble IL-4R (which targets only IL-4 signaling), had little effect on development of AHR or airway inflammation (38), implying that IL-13, more than IL-4, is important in the development of AHR in already established allergic airway disease. A direct effect of IL-13 on airway epithelial cells has been proposed with induction of MUC-5 gene expression. 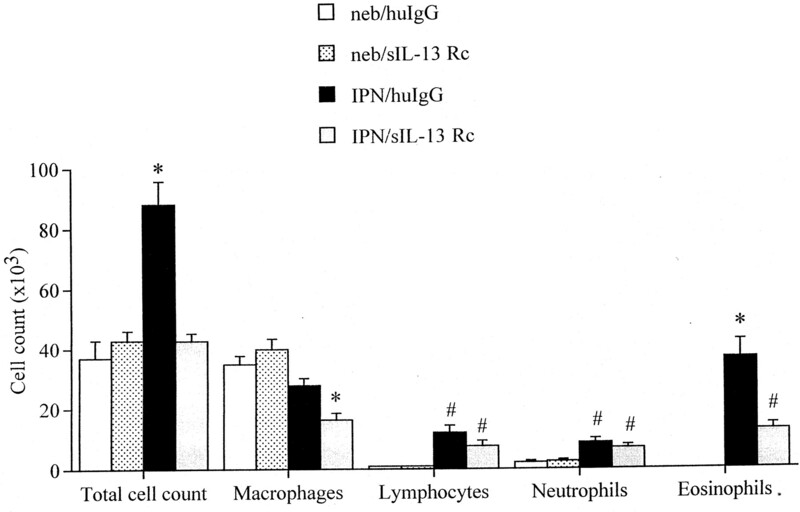 IL-13 may also induce neutrophil recruitment (4) and activation (15) in the airways. Interestingly, in allergic airway disease neutrophil recruitment may be directly associated with goblet cell metaplasia as pretreatment with an IL-8-blocking Ab prevented both IL-13-induced neutrophil recruitment and mucin production (15). In the present study, inhibition of IL-13 led to a small reduction of neutrophil numbers in BAL fluid, but whether this neutrophil influx plays a role in the development of AHR remains to be elucidated. Under some conditions, mucus production may not be directly associated with alterations in airway function (24). In humans, the measurement of early and late phase airway responses following allergen challenge is often used to assess the effectiveness of treatment interventions (39, 40). Murine models of allergic airway disease demonstrate an early and late airway response to inhaled allergen. Previous studies have shown that the early response following allergen challenge is dependent on the presence of allergen-specific IgG (41) and can be abolished using β2-adrenoceptor antagonists or cromoglycates (29). In the present study, neutralization of IL-13 had no effect on the early airway response. This is not surprising as neutralization of IL-13 did not have any effect on serum levels of allergen-specific Abs. It has been shown that the LPR is associated with an increase in IL-5 levels in BAL fluid and tissue eosinophilia and can be suppressed by treatment with either anti-IL-5, cromoglycates, or hydrocortisone (29). We found increased levels of IL-13 in BAL fluid at the time of the late airway response and treatment with the sIL-13Rα2-Fc completely abolished the development of the LPR. Interestingly, IL-13 neutralization showed no effect on tissue eosinophil inflammation at this time point, supporting the possibility of a direct effect of IL-13 on airway function, independent of airway inflammation. Secondary exposure to a single provocative OVA aerosol in sensitized mice elicited airway changes similar to those obtained after a series of primary challenges, confirming previous results (30). We previously showed a differential regulation of AHR in the central and peripheral airways monitoring these two parameters of airway function (30, 33). It has been proposed that changes in dynamic compliance reflect narrowing of peripheral airways, whereas changes in airway resistance represent airflow obstruction of central airways (42, 43, 44). In previous studies, we have shown that eosinophilic inflammation might relate to changes in the central airways while changes in the epithelium of peripheral airways, including mucus production, may relate to changes in dynamic compliance (30, 33). Interestingly, and different from anti-IL-5 and anti-very late Ag-4 treatment, sIL-13Rα2-Fc is capable of inhibiting both changes in airway resistance and dynamic compliance, suggesting an effect on central and peripheral airway function following secondary challenge. In summary, our results show that IL-13 is essential to the development of a LPR following airway challenge of mice with established allergic disease. In addition, we demonstrate that blockade of IL-13 can prevent changes in central and peripheral airway physiology following secondary allergen challenge. The data suggest that targeting IL-13 may be important in the treatment of chronic allergic asthma. We thank Dr. J. J. Lee (Mayo Clinic, Scottsdale, AZ) for providing the anti-MBP Ab, L. N. Cunningham, and D. Nabighian (National Jewish Medical and Research Center) for their assistance. ↵1 This work was supported by National Institutes of Health Grants HL-36577 and HL-61005 and Environmental Protection Agency Grant R825702 (to E.W.G.). C.T. is supported by the Deutsche Forschungsgemeinschaft (Ta 275/2-1) and is recipient of the Michael and Eleanore Stobin Fellowship. C.D. is a recipient of a grant from Société de Pathologie Thoracique du Nord/Pas-de-Calais, France. ↵2 C.T. and C.D. contributed equally to this work. ↵4 Abbreviations used in this paper: AHR, airway hyperresponsiveness; BAL, bronchoalveolar lavage; EPR, early phase response; LPR, late phase response; RL, lung resistance; Cdyn, dynamic compliance; EU, ELISA unit; sIL-13Rα2-Fc, soluble IL-13α2-IgGFc; hIgG, human IgG; MCh, metacholine; Penh, enhanced pause; MBP, major basic protein; PAS, periodic acid Schiff; BM, basement membrane.